The Aztec Trainer Fired Heater Simulator was developed over 15 years ago to be used with PowerPoint presentations for operator and unit engineer training in fired heater safety and operation. Aztec Engineering can assist in developing plant specific PowerPoint presentations or the user can develop his custom presentations. Currently "standard" presentations are being developed that are included as part of the installation package. The first presentation, "Heater Inspection and Draft" is included in the latest version of the simulator. Additional presentations can be downloaded and installed as they become available. 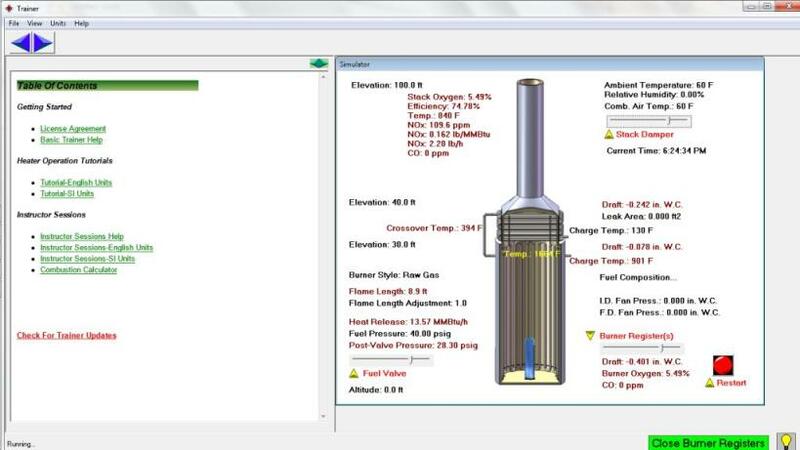 Download a completely functional demonstration copy of the Aztec TRAINER Fired Heater Simulator to use for two weeks for evaluation. Want to save time? Schedule a 1 hour demonstration using Skype to see the major features.